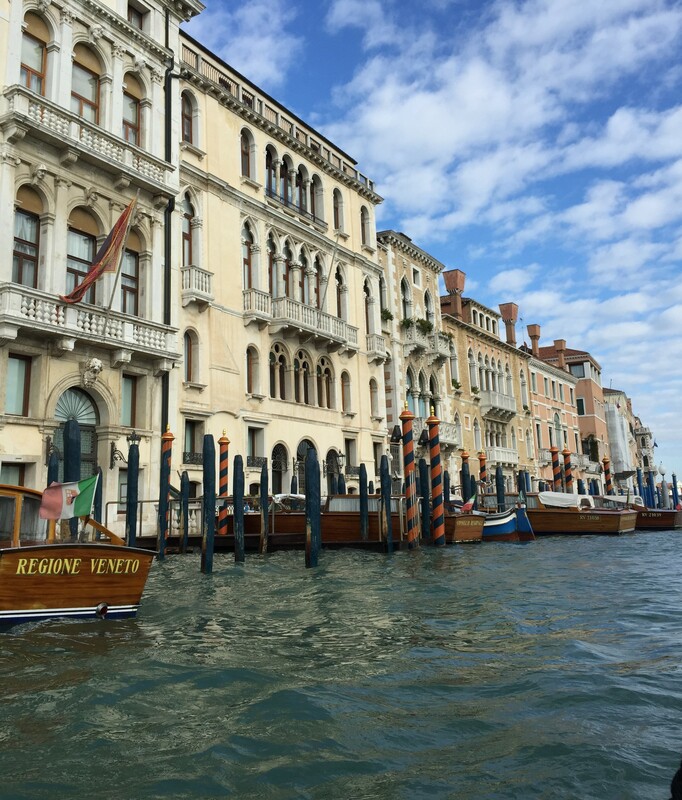 By the second day of Venice, we had all become pros at navigating by water taxi, as well as walking on wooden planks in order to avoid flooding from the water’s high tides. Yes, believe it or not-the islands do flood fairly often in the months of November and December, when the water reaches high tides. But, to our advantage, there were platforms that were set up in order for us to walk along, so that our legs were not soaked by the time we reached our appointments. We were even told that in years past, the water reached the students’ knees, making it incredibly difficult to walk! We lucked out, however, and it was actually fun to have an alternate walking path for two days. Our first stop of the day was to Doge’s Palace, which is situated in Piazza San Marco and is one of Venice’s major landmarks! It was the home of the Doge, who was the major authority of the Republic of Venice. The Gothic architecture of the building was so beautiful to observe, as we jumped back into history and were exposed to the lavish lifestyle of the Doge in years past. We saw several apartments, chambers and important meeting halls which were all designated for a specific purpose. Last but not least, we walked through a prison, which was connected to the Palace via “The Bridge of Sighs.” As sad as it sounds, the “Bridge of Sighs” was appropriately named to signify the heavy sighs that prisoners would exhale as they glanced at their last moment of freedom before entering their jail cell. 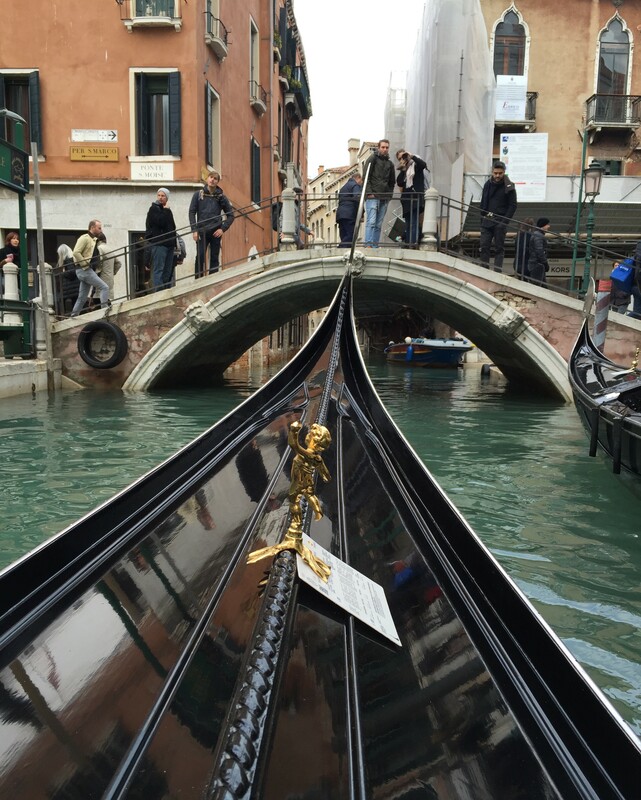 Before we got to Venice, I told myself that I could not leave the island without going on a gondola ride, since that is one thing that it is so well known for. 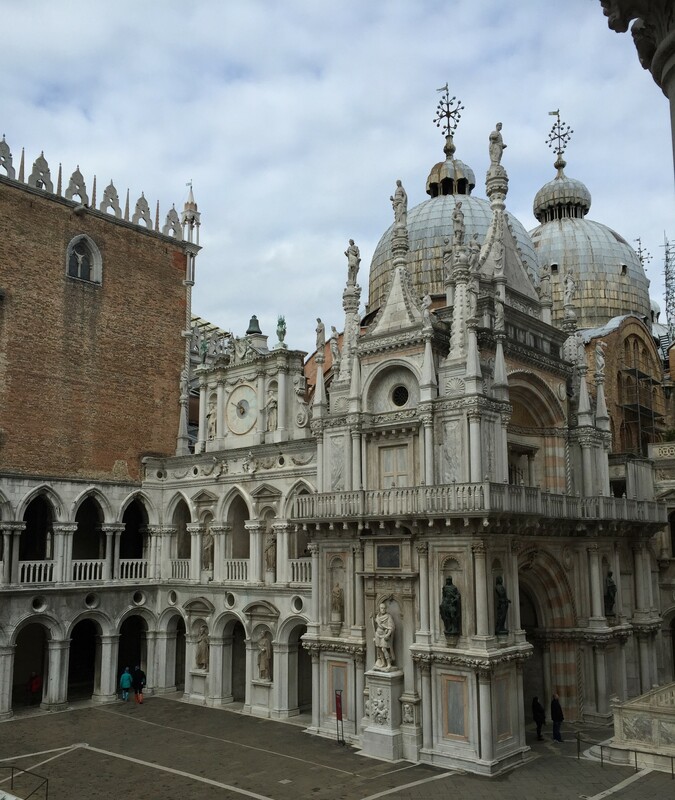 So, after exploring Doge’s Palace, a group of us went on a twenty minute gondola ride to take in the beautiful scenery surrounding us, and of course getting plenty of pictures along the way! 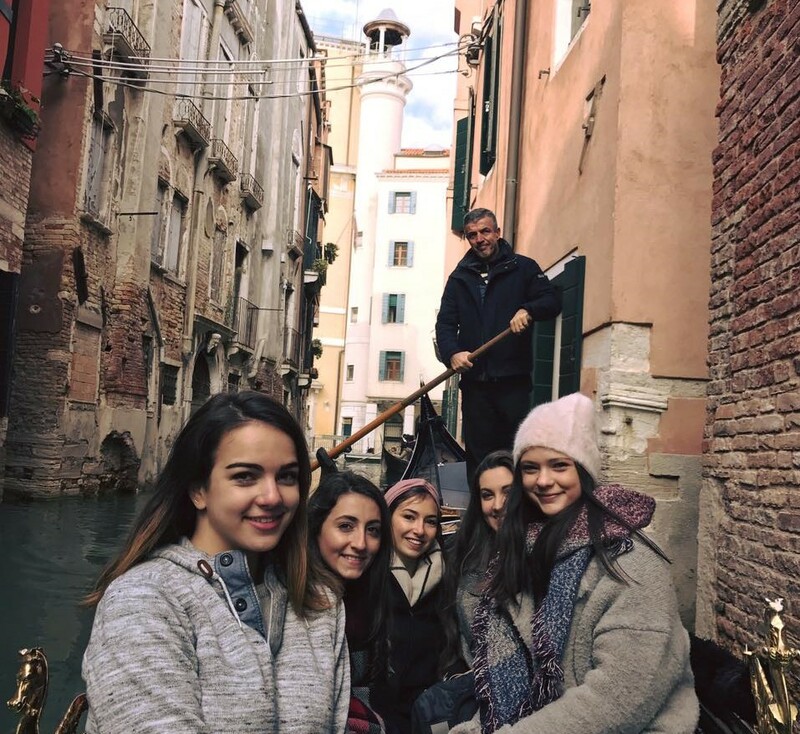 When you visit Venice, I am sure this is one activity that you will not want to miss, and I recommend finding a group of about 6 people to do it with, as it can be fairly expensive (around 80 euros or higher for a single ride). It is definitely worth it though, to experience at least once in your life! To conclude our Venice trip, we made a visit to Atelier Nicolao, which is a famous tailor’s shop that produces costumes maintaining Venice’s long-standing traditions and history of dressing. These costumes are now created for Ballets, Theatre performances, movies, television shows, and Opera houses. Deceivingly small from the exterior, this shop is home to over 10,000 sets of accessories, outfits, and headgear! It was amazing to see the intricate detailing and craftsmanship that are included in all of the products created by the workshop. It was also interesting to see how Venice’s history has been carried on throughout the years and are now on display and used for several modes of entertainment! 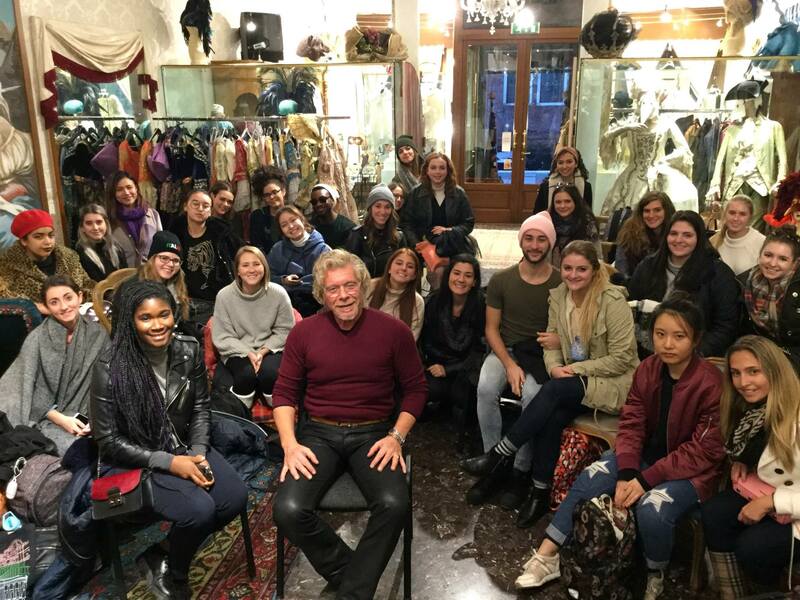 The FBM students at the Atelier Nicolao visit!